^ D. R. Soderblom; J. R. King. Solar-Type Stars: Basic Information on Their Classification and Characterization. Solar Analogs : Characteristics and Optimum Candidates. 1998 [2008-02-26]. ^ E. E. Mamajek; L. A. Hillenbrand. Improved Age Estimation for Solar-Type Dwarfs Using Activity-Rotation Diagnostics. Astrophysical Journal. 2008, 687 (2): 1264. Bibcode:2008ApJ...687.1264M. arXiv:0807.1686. doi:10.1086/591785. ^ 4.0 4.1 4.2 4.3 4.4 4.5 4.6 4.7 4.8 SIMBAD Astronomical Database. SIMBAD. Centre de Données astronomiques de Strasbourg. [2009-01-14]. ^ 5.0 5.1 5.2 5.3 5.4 5.5 5.6 5.7 5.8 Sousa, S. G.; 等. Spectroscopic parameters for 451 stars in the HARPS GTO planet search program. Stellar [Fe/H] and the frequency of exo-Neptunes. Astronomy and Astrophysics. August 2008, 487 (1): 373–381. Bibcode:2008A&A...487..373S. arXiv:0805.4826. doi:10.1051/0004-6361:200809698. See VizieR catalogue J/A+A/487/373. ^ 6.00 6.01 6.02 6.03 6.04 6.05 6.06 6.07 6.08 6.09 6.10 6.11 6.12 6.13 6.14 6.15 6.16 Santos, N. C.; Israelian, G.; Randich, S.; García López, R. J.; Rebolo, R. Beryllium anomalies in solar-type field stars. Astronomy and Astrophysics. October 2004, 425 (3): 1013–1027. Bibcode:2004A&A...425.1013S. arXiv:astro-ph/0408109. doi:10.1051/0004-6361:20040510. ^ 7.00 7.01 7.02 7.03 7.04 7.05 7.06 7.07 7.08 7.09 7.10 7.11 7.12 7.13 7.14 7.15 Holmberg J., Nordstrom B., Andersen J. The Geneva-Copenhagen survey of the solar neighbourhood. III. Improved distances, ages, and kinematics. Astronomy and Astrophysics. July 2009, 501 (3): 941–947. Bibcode:2009A&A...501..941H. arXiv:0811.3982. doi:10.1051/0004-6361/200811191. See Vizier catalogue V/130. ^ 8.0 8.1 Porto de Mello, G. F.; Lyra, W.; Keller, G. R. The Alpha Centauri binary system. Atmospheric parameters and element abundances. Astronomy and Astrophysics. September 2008, 488 (2): 653–666. Bibcode:2008A&A...488..653P. arXiv:0804.3712. doi:10.1051/0004-6361:200810031. ^ Casagrande, Luca; Flynn, Chris; Portinari, Laura; Girardi, Leo; Jimenez, Raul. The helium abundance and ?Y/?Z in lower main-sequence stars. Monthly Notices of the Royal Astronomical Society. December 2007, 382 (4): 1516–1540. Bibcode:2007MNRAS.382.1516C. arXiv:astro-ph/0703766. doi:10.1111/j.1365-2966.2007.12512.x. ^ 11.0 11.1 Valenti, Jeff A.; Fischer, Debra A. Spectroscopic Properties of Cool Stars (SPOCS). I. 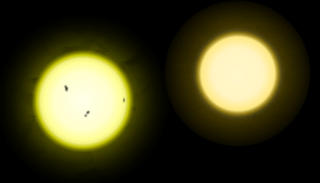 1040 F, G, and K Dwarfs from Keck, Lick, and AAT Planet Search Programs. The Astrophysical Journal Supplement Series. July 2005, 159 (1): 141–166. Bibcode:2005ApJS..159..141V. doi:10.1086/430500. See VizieR catalogue J/ApJS/159/141. ^ Kovtyukh, V. V.; Soubiran, C.; Belik, S. I.; Gorlova, N. I. High precision effective temperatures for 181 F-K dwarfs from line-depth ratios. Astronomy and Astrophysics. 2003, 411 (3): 559–564. Bibcode:2003A&A...411..559K. arXiv:astro-ph/0308429. doi:10.1051/0004-6361:20031378. ^ Williams, D.R. Sun Fact Sheet. NASA. 2004 [2009-06-23]. （原始内容存档于2010-07-15）. ^ 14.0 14.1 14.2 14.3 Meléndez, Jorge; Ramírez, Iván. HIP 56948: A Solar Twin with a Low Lithium Abundance. The Astrophysical Journal. November 2007, 669 (2): L89–L92. Bibcode:2007ApJ...669L..89M. arXiv:0709.4290. doi:10.1086/523942. ^ Sousa, S. G.; Fernandes, J.; Israelian, G.; Santos, N. C. Higher depletion of lithium in planet host stars: no age and mass effect. Astronomy and Astrophysics. March 2010, 512: L5. Bibcode:2010A&A...512L...5S. arXiv:1003.0405. doi:10.1051/0004-6361/201014125. ^ 16.0 16.1 16.2 16.3 16.4 16.5 16.6 16.7 16.8 16.9 Porto de Mello, G. F.; da Silva, R.; da Silva, L.; de Nader, R. V. A photometric and spectroscopic survey of solar twin stars within 50 parsecs of the Sun; I. Atmospheric parameters and color similarity to the Sun. Astronomy and Astrophysics. March 2014, 563: A52. Bibcode:2014A&A...563A...52S. arXiv:1312.7571. doi:10.1051/0004-6361/201322277. ^ Takeda, Yoichi; Tajitsu, Akito. High-Dispersion Spectroscopic Study of Solar Twins: HIP 56948, HIP 79672, and HIP 100963. Publications of the Astronomical Society of Japan. 2009, 61 (3): 471–478. Bibcode:2009PASJ...61..471T. arXiv:0901.2509T 请检查|arxiv=值 (帮助). doi:10.1093/pasj/61.3.471. ^ 18.0 18.1 18.2 18.3 King, Jeremy R.; Boesgaard, Ann M.; Schuler, Simon C. Keck HIRES Spectroscopy of Four Candidate Solar Twins. The Astronomical Journal. November 2005, 130 (5): 2318–2325. Bibcode:2005AJ....130.2318K. arXiv:astro-ph/0508004. doi:10.1086/452640. ^ Vázquez, M.; Pallé, E.; Rodríguez, P. Montañés. Is Our Environment Special?. The Earth as a Distant Planet: A Rosetta Stone for the Search of Earth-Like Worlds. Astronomy and Astrophysics Library. Springer New York. 2010: 391–418. ISBN 978-1-4419-1683-9. doi:10.1007/978-1-4419-1684-6. See table 9.1. ^ A. Önehag; A. Korn; B. Gustafsson; E. Stempels; D. A. VandenBerg. M67-1194, an unusually Sun-like solar twin in M67. Astronomy and Astrophysics. 2011, 528. Bibcode:2011A&A...528A..85O. arXiv:astro-ph/1009.4579 请检查|arxiv=值 (帮助). doi:10.1051/0004-6361/201015138. ^ 22.0 22.1 22.2 22.3 Turnbull, M. C.; Tarter, J. C. Target Selection for SETI. I. A Catalog of Nearby Habitable Stellar Systems. The Astrophysical Journal Supplement Series. 2002, 145: 181. Bibcode:2003ApJS..145..181T. arXiv:astro-ph/0210675. doi:10.1086/345779. ^ Solar System 'twin' found. BBC News. 2003-07-03. G. W. Lockwood & B. A. Skiff. The Photometric Variability of Sun-like Stars: Observations and Results, 1984—1995. The Astrophysical Journal. 1997, 485 (2): 789–811. Bibcode:1997ApJ...485..789L. doi:10.1086/304453. G. Porto de Mello, R. da Silva, & L. da Silva. A Survey of Solar Twin Stars within 50 Parsecs of the Sun. Bioastronomy 99: A New Era in the Search for Life. 2000, 213: 73. Bibcode:2000ASPC..213...73P. M. C. Turnbull & J. C. Tarter. Target Selection for SETI. II. Tycho-2 Dwarfs, Old Open Clusters, and the Nearest 100 Stars. The Astrophysical Journal Supplement Series. 2003, 149 (2): 423–436. Bibcode:2003ApJS..149..423T. doi:10.1086/379320. J. C. Hall & G. W. Lockwood. The Chromospheric Activity and Variability of Cycling and Flat Activity Solar-Analog Stars. The Astrophysical Journal. 2004, 614 (2): 942–946. Bibcode:2004ApJ...614..942H. doi:10.1086/423926. J. D. Jr do Nascimento, M. Castro, J. Meléndez, M. Bazot, S. Théado, G. F. Porto de Mello. Age and mass of solar twins constrained by lithium abundance. Astronomy and Astrophysics. 2009, 501 (1): 687–694. Bibcode:2009A&A...501..687D. arXiv:0904.3580. doi:10.1051/0004-6361/200911935.